If you are looking for a recommendation on the best places to eat in Paso Robles, your search is over. The San Luis Obispo County Visitors Guide is happy to suggest some of the best cafes, bistros, restaurants, and fine dining rooms in Paso Robles. Berry Hill Bistro – Right on the beautiful downtown park with outdoor seating, Berry Hill Bistro offers American-style fish & meat dishes, salads and more. It has a full bar and a large wine list. 1114 Pine St, Paso Robles, CA 93446. (805) 238-3929. Big Bubba’s Bad BBQ – Big family fun is what you’ll find at this western-themed restaurant. Belly up to the full bar. Don’t miss the onion rings or the mechanical bull. 1125 24th Street, Paso Robles, CA 93446. (805) 238-6272. Buona Tavola – Antipasti, hand crafted pastas, generous main courses and truly inspired desserts, such as Chef Varia’s famous tiramisu. The highest quality and freshest foods. Open weekdays for lunch & dinner. Open Sat. & Sun. for dinner at 5:30 p.m. 943 Spring St. Call for reservations. (805) 237-0600. Marv’s Original Pizza Co. – Pizza isn’t exactly fine dining, but every once in a while, it’s a must have. Marv’s Pizza is the best pizza in Paso Robles and it’s located right on the downtown park. Come try their handcrafted pizza’s with fresh ingredients. Marv’s Original Pizza Co., 729 12th St., Paso Robles, CA 93446. (805) 238-1851. McPhees Grill – This is an outstanding upscale oak grilling bistro. They serve steaks, seasonal seafood, pork, lamb and fresh local vegetables. Open for lunch and dinner. Call for reservations. It’s just outside of Paso Robles in scenic small-town Templeton. McPhees Grill, 416 S. Main St., Templeton, Ca 93465 (805) 434-3204. Odyssey World Cafe – Cozy, casual, comfortable! Gourmet sandwiches, salads, burgers, steaks, stir fry, desserts. Outdoor seating available. Open daily 11 am-8:30 pm (Friday & Saturday til 9 pm). Downtown, 1214 Pine Street, Paso Robles, CA 93446. odysseyworldcafe.com (805) 237-7516. 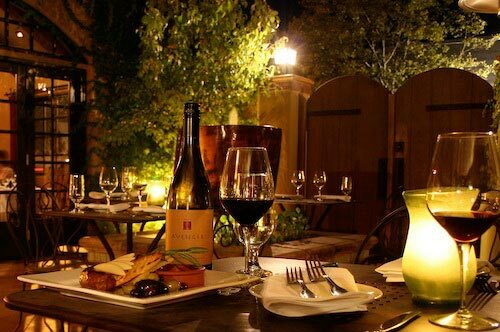 Paso Robles Inn & Steakhouse – Escape into history and delectable cuisine. Classic steakhouse with a contemporary twist, using fresh local products and produce. Enjoy the updated seasonal menu with sandwiches, pastas and more in addition to your favorite steaks. Features extensive local wine list. 1103 Spring Street, Paso Robles, CA 93446. pasoroblesinn.com, (805) 238-2660. Red Scooter Deli – If you are looking for a picnic in the downtown city park, stop by this tasty little deli for a freshly made sandwich or salad. It’s located at 1102 Pine St, Paso Robles, CA 93446. (805) 237-1780. Ristorante Il Cortile – The town’s newest fine dining Italian restaurant. Seasonal menus created with fresh, locally-sourced ingredients. Homemade pastas, fresh seafood, meats and antipasti. Dinner served 7 nights a week. 608 12th St., Paso Robles, CA 93446. ilcortileristorante.com, (805) 226-0300. Rustic Fire – For delicious and freshly made oven-baked pizzas, fabulous salads, and homemade gelatos, check out Rustic Fire Pizza at 1145 24th Street in Paso Robles, CA. (805) 238-7711. Thomas Hill Organics Bistro – From our farm to your table. A creative menu featuring organically-grown produce and natural proteins. Enjoy local wines, lunch or dinner in our dining room or outdoor patio. Located downtown in the alley at 13th St. 1305 Park St., Paso Robles, CA 93446. thomashillorganics.com, (805) 226-5888. Vic’s Cafe – A family diner serving the best breakfast in town and homemade mouth-watering desserts. Call ahead and order your box lunches for wine tasting. A downtown Paso tradition. Don’t miss it. 841 13th St., Paso Robles, CA 93446. (805) 238-3988. Vivant Fine Cheese – With over 150 cheeses to choose from, expert staff will assist you with wine pairing or creating a gourmet picnic box. Charcuterie and local food products. Lovely outdoor patio. 840 11th St, Paso Robles, CA 93446. (805) 226-5530. Yanagi Sushi & Grill – Voted best sushi in the county, it’s a feast for the eyes and the taste buds. Call to reserve a teppan table, or sit at the fresh sushi bar, either way, you get to watch your chef in action. 1221 Park St., Paso Robles, CA 93446 (805) 226-8867.